New Polymer Film dubbed ‘Fusion’ that is developed by Genie Lens Technologies is claimed capable of boosting your present photovoltaic solar panel by 10 per cent in terms of efficiency. 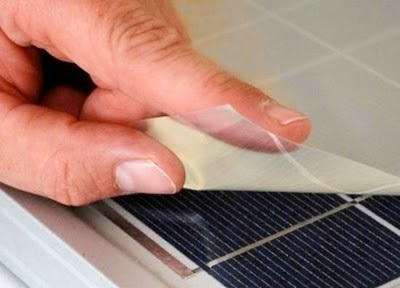 Simply stick the transparent Fusion polymer film sticker on the surface of the solar panels, and it will help to increase the PV solar panel’s solar energy harvesting efficiency. Fusion itself is made of polymer film that was embossed with microstructures capable of bending incoming light. In this way, the polymer film will be able to absorb and convert more solar power into electricity. If you could get cheap panels, you would further lower the cost per watt of your home made solar power. Tests at NREL have proved that the film increases power output on average between 4 percent and 12.5 percent.